The Australian Commando Association (Victoria) is the state organisation for all World War 2 and post-WW2 former and current serving Commando and attached sub-unit members. 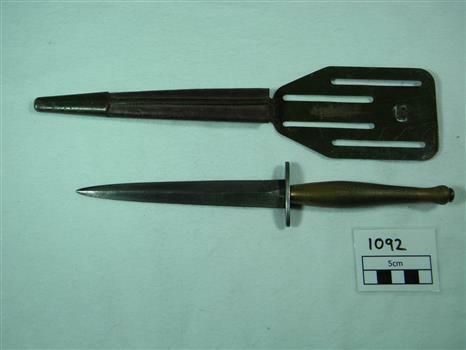 The collection covers both WW2 and post-WW2 items. The Association does not have its collection currently on public display, apart from selected items on display to the public at the Waverley RSL, 161 Coleman Parade Glen Waverley, Victoria. RSL Hours: 9am – 1am. Rectangular black and white glossy head and shoulders portrait print of 'Mac' Grant. 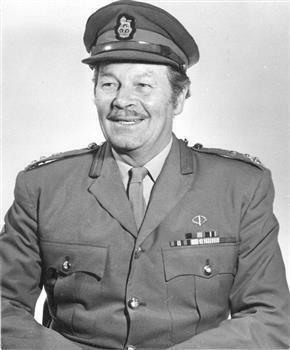 Major WH 'Mac' Grant was the founding Officer Commanding of 1 Commando Company when it was first raised in Sydney in 1955. 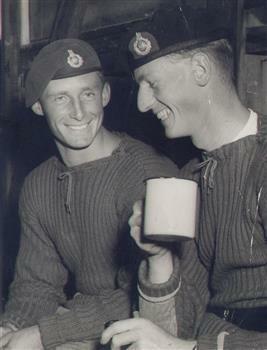 1 and 2 Commando Companies, in Sydney and Melbourne, were the first of the post-WW2 Commando and Special Forces units raised in Australia since the disbanding of the WW2 Commando units. Major Grant served as a Commando in WW2. Framed print, showing WW2 and post-WW2 Commandos and the original post-WW2 'Strike Swiftly' beret badge. The print depicts the evolution from WW2 Commandos to present-day post-WW2 Commandos, to 2005. 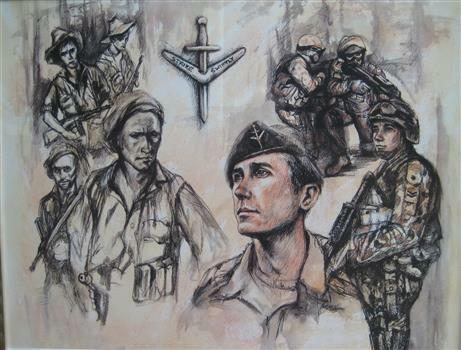 The print celebrates the formation of the post-WW2 Commandos and their 50th anniversary in 2005. 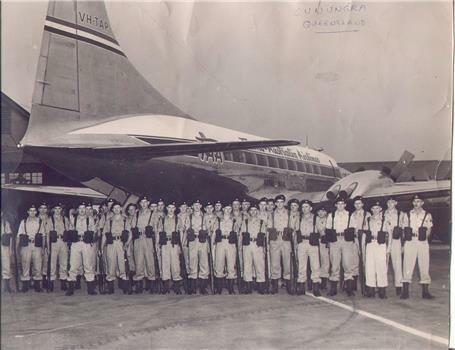 Photograph - 2 Commando Company emplaning for 1956 annual camp at Canungra, Queensland. A4 sheet folded to four page A5 pamphlet, pastel paper, showing logo of 1st Commando Regiment Association (Victoria). 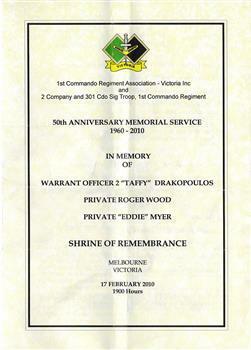 The pamphlet gives the order of proceedings for a service held on 17 February 2010, at the Shrine of Remembrance, Melbourne, to mark the 50th anniversary of the 'Rip incident' involving 75 Commandos with three deaths and a number of injuries. The service was a mark of respect to the lost men and their families; it was a tragic, but significant, event in the history of the relatively new Commando unit, remembered by former serving members. Shrine of Remembrance Melbourne logo on back cover. Rectangular soft paperback cover, blue, with image, 20 pages plus cover. 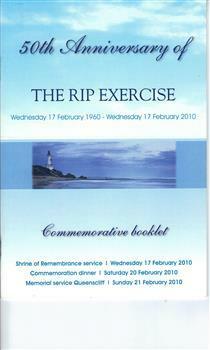 The booklet was presented to all attendees at the 50th anniversary services in 2010 of the 1960 Rip disaster, and relates the circumstances of the event and gives brief biographies of those lost. The booklet outlines the Rip tragedy, that brought about significant changes to the safety requirements of military training, both seaborne and in general. Cpoyright 1st Commando Regiment Association (Victoria) Inc 2010. McDermott and Holmes were crucial in providing specialist training for the newly raised Commando units, that had almost no Commando experience within their own ranks. The reprint marked the 45th anniversary of 2 Commando Company, the first (along with 1 Commando Company) post-WW2 SF unit, and explained the origins of its WW2 predecessors. Newsletter - Commando - the official newsletter of 2 Commando Association. Vol 1 No 1 Aug 1983. The first newsletter published by the newly formed Association. 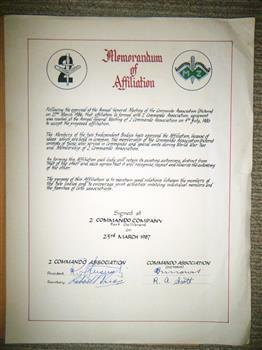 The Association members were former or current members of 2 Commando Company or its sub-units. The first newsletter published by the newly formed Association, with the inaugural report by the first president. Booklet , 175 mm by 245 mm, staple bound, 30 pages, full colour cover and centre pages. A publication to celebrate the 50th anniversary of the dedication of the WW2 Commando memorial at Tidal River on Wilsons Promontory, Victoria, where the first Commando units trained. Wilsons Promontory is regarded as the birthplace of the Australian and New Zealand WW2 Commandos. An annual service is conducted each November at the Tidal River WW2 Commando memorial. Since almost all of the WW2 Commando veterans have passed, the annual service is now conducted by the post-WW2 Australian Commando Association Victoria. The WW2 Commando Association disbanded in 2010. 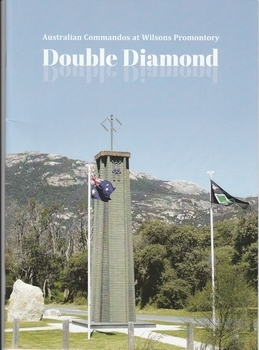 The booklet recognises the raising of the Commandos and their training at Wilsons Promontory, and their continued recognition by the annual memorial service. Copy of single page letter, early "quarto" size. Headed 2 Commando Company (CMF) Room 31, "D" Block Albert Park Barracks MELBOURNE (Undated). Signed by Peter Seddon, OC 2 Commando Company Written in early June 1955, (Reference details in the letter), shortly after the Unit was raised. 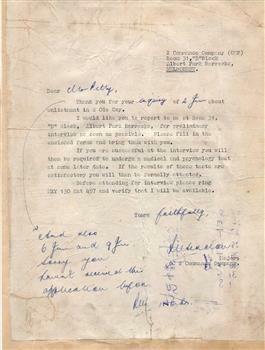 The letter was written to John Petty, who was one of the original members of the newly raised Company,, the first of 2 Commando Units (the other in Sydney) raised since the WW2 Cdo Units were disbanded. 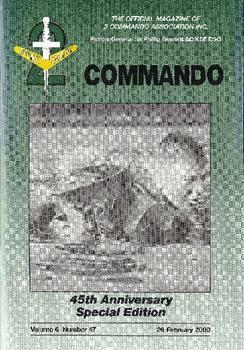 It portrays the beginnings of the new Commando era. Headed 2 Commando Company (CMF) Room 31, "D" Block Albert Park Barracks MELBOURNE (Undated). Signed by Peter Seddon, OC 2 Commando Company Written in early June 1955, (Reference details in the letter). Rectangular black and white glossy head and shoulders photograph of subject. 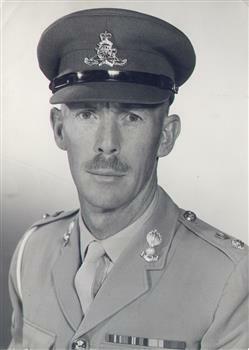 Major Peter Seddon was the founding Officer Commanding of 2 Commando Company when it was first raised in Melbourne in 1955. I and 2 Commando Companies, in Sydney and Melbourne, were the first of the post-WW2 Commando and Special Forces units raised in Australia since the disbanding of the WW2 Commando units. "Peter Seddon" Donated by Peter Seddon. Brown cardboard, spiral bound 'The Empire Sketch Book' with five pencil drawings on art paper by Corporal F. J. Papworth during his Commando service at Tarakan Hill, Borneo during World War II. 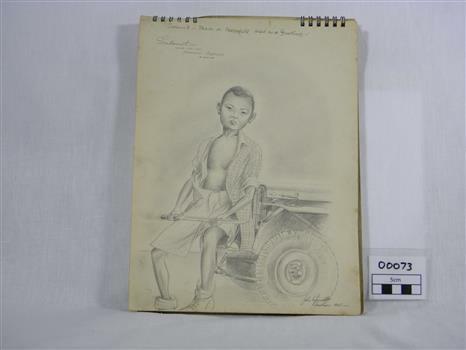 Three of the drawings depict the army camp at Tarakan Hill during May 1945; the fourth drawing shows a young boy from Tarakan sitting on an army jeep and the last is a rough sketch of a baby drawn in 1947. Corporal Francis John Papworth (VX66806) served in the 2/4 Australian Commando Squadron in Timor, New Guinea and Borneo, Tarakan during World War II. His pencil drawn images of the Tarakan camp during May 1945 give an insight into the conditions at that time. On front cover in handwritten in ink "PIC of Geo-Wallace/INSIDE". On first drawing handwritten in pencil on top righthand corner "TARAKAN HILL/looking NNE from machine shop section of Tarakan Oilfield/May 15 1945". On second drawing handwritten in pencil at bottom righthand corner "TARAKAN HILL looking from BANK pill box right centre -/15 May 45". On third drawing handwritten in pencil at top righthand corner "TARAKAN HILL and DUTCH/MACHINE SHOPS-Looking from KINGS CROSS/The morning of the 4th May 1945-/0745 hrs-/The Quiet before the storm". On fourth drawing handwritten in top in pencil "Salamit - Peace or Peaceful[l] Used as a Greeting/Salamit-/ORONG LAKI LAKI/TARAKAN. BORNEO/19 MAY 45." All four sketches are signed "John Papworth/Tarakan 1945".On fifth sketch handwritten in pencil "Michael/Signed by/2 Feb 1947". 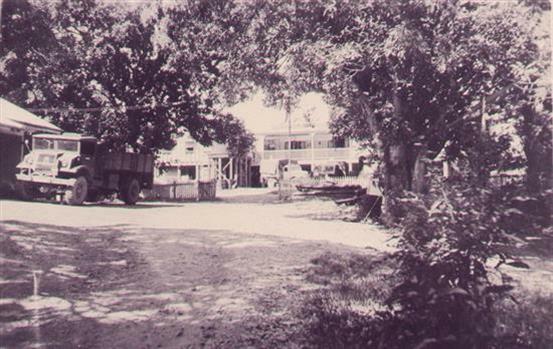 The photo shows a view of the WW2 Z Special Unit's headquarters in Cairns. Z Special Unit and its operations were kept secret during WW2 and such photos may be rare. 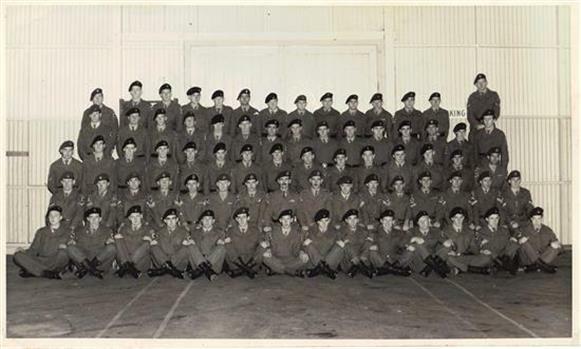 B & W group photo unframed, 5 rows tiered, 73 men in winter battledress at the 2 Commando Company depot at Ripponlea, Melbourne in 1958. A separate document names most of the men. Unit members in the photo: Back row: Peter Herd, Mick Stewart, Ian Bunston, Russ Bradley, Bob West, Peter Reid, Norm 'Doc' Willoughby, Brian Hinneburg, Claude Gillard, _______ , Kevin Hatfield, Ian Hicks, Mack Hinds, John Woodruff. 4th row: Geoff Smith, Phil 'Juni0r' Meakins, Phillip Roff, George Wing, 'Bluey' De Clerk, Bob 'Canada' Johnston, Jim Walsh, Mike Hicks, Ern Jeffries, Carl 'Dutchy' Hulsbergen, Leigh Power, __________ , Norm 'Mick' Kennedy, Ray Bunyard, Jack Murray. 3rd row: Jeff Tomlinson, ______ , Vince Nehill, Jim Stephens, Bert Boatwright, Bill Leach, Bob Reid, Peter 'Padre' Bowden, ______ , Frank Read, Peter Higgins, Bill Salmon, John Hutchinson, Gus Kongas, Tony Poole. 2nd row: Roman Stuczynski, Stan Polan, Allan Moore, Don Bergman, Col 'Ali' Barbour, Peter Askew, Ron Smith, OC Major John Hutcheson, Adj Capt John Pritchard, Lt John O'Rourke, Ron Scott, George 'Taffy' Drakopoulos, Ted Malone, Ray Sanders, Kevin Collins, Barry Creighton. 1st row: Tom Massey, Mick Thurlough, Glen Watterson, Joe Frazer, Warren Hutchings, Max Coulson, Graham Gould?, Maurice 'Elvis' Priestly, _______ , 'Bluey' Darlington, 'Bluey' _____ , _____________ , 'Tich' McIntyre, Jim Trainor. Proovided by Jim Trainor. One of a very few photos only of (almost) the complete personnel of 2 Cdo Coy in its early years. Described by Jim Trainor as Ripponlea pay parade July 1958. Black wooden frame with gold-painted border. Photo has large white borders. Black and white photograph of the WW2 Krait of Operation Jaywick fame, on Sydney Harbour in 1964 with crew members and four former Jaywick operatives on board - Berryman, Carse, Jones and Young. Cdo Assoc Victoria presented it to Exmouth Heavy AA Assoc. This was because the Krait left Exmouth on the successful Opn Jaywick raid on Japanese occupied Singapore Harbour in 1943. Exmouth Heavy AAA has now disbanded and daughter of a foundation member donated it back to the (post-WW2) Vic Cdo Assoc in July 2012. The former Japanese fishing boat, as MV Krait left Exmouth on the successful Opn Jaywick raid on Japanese occupied Singapore harbour in 1943. 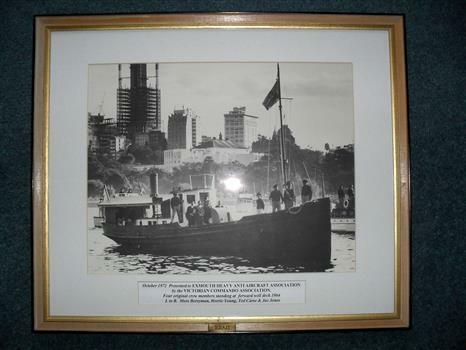 The vessel was partly restored, and motored into Sydney harbour in 1964 with former Z Special members on board, including the Jaywick operatives Berryman, Carse, Jones and Young. Legend: October 1972 Presented to EXMOUTH HEAVY ANTI AIRCRAFT ASSOCIATION by the VICTORIAN COMMANDO ASSOCIATION. Four original crew members standing at forward well deck 1964. L to R Moss Berryman, Horrie Young, Ted Carse & Joe Jones. Brass plate on frame: "KRAIT." On back: "Barilyn Images 59 85 4666." 12 page (white) rectangular A5 paper booklet, including cardboard cover. 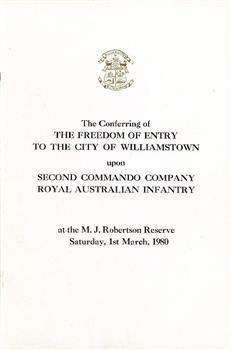 The booklet gives the order of proceedings for the ceremony, on 1st March 1980, of the conferring of the Freedom of Entry to the City of Williamstown upon Second Commando Company, based at Fort Gellibrand, Williamstown. This was the first time the Commando Company had been formally recognised in a traditional ceremony by the city where it was based. Coat of arms of the City of Williamstown on front cover and page 1. Title: "The Conferring of The Freedom of Entry to the City of Williamstown upon Second Commando Company Royal Australian Infantry." 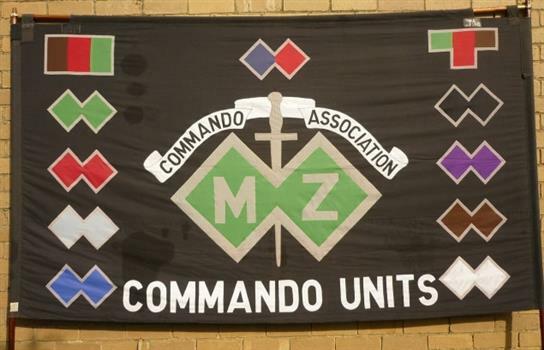 Commando Association M Z Commando Units Eleven sewn-on Commando Unit colour patches, and the M - Z double diamond logo and wording as above. Circular cloth sew-on badge, black and white with stiched-on parachutist with red and white striped canopy; gold stitched border. 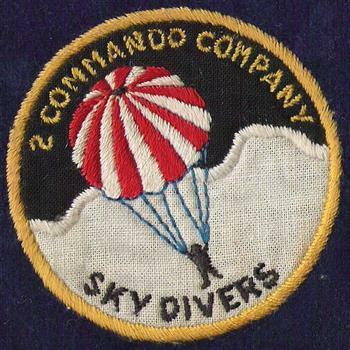 The patch badge was worn on shirts by members of the 2 Commando Company Sky Divers, one of Victoria's and Australia's earliest Skydiving clubs. Formed in 1961 by Warren Hutchings within 2 Commando Company, members jumped under the auspices of the Army and RAAF. One of the few military sponsored clubs, it was a pioneer in Australian skydiving before the advent of the Australian Parachute Federation. Shooting stick, aluminium pole with folding leather seat on top and spike at base. 2 sheet quarto (four sides) white semi-glossy paper with black type and logo. Order of service. 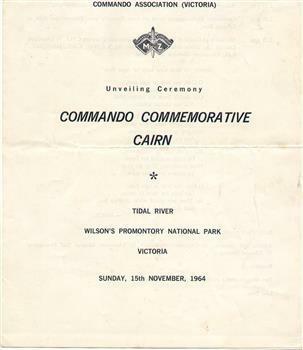 This was the "Order of service" for the inaugural unveiling of the WW2 Commando Cairn at Tidal River, Victoria. Lt General Sir Edmund Herring, Lt Governor of Victoria addressed the assembly, 2 Commando Company soldiers were the Guard of Honour, and the 4/19 PWLH Regt band played. This was the first official memorial to WW2 Commandos, located at Wilsons Promontory where the Commando units were first trained. A memorial ceremony is held in November each year since 1964. Honour rolls of WW2 and post-WW2 Commandos who died in battle or training were added in 2011. 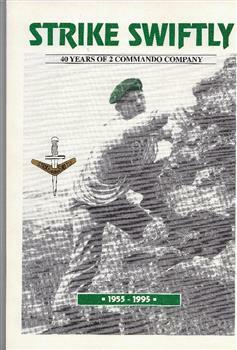 Book - Strike Swiftly - 40 years of 2 Commando Company - 1955 -1995. Soft cover; White cover, green main title. Contains chronological concise history of the Unit, also with themed chapters, with limited photographs. Cover photo of Commando rock climbing, wearing green beret. 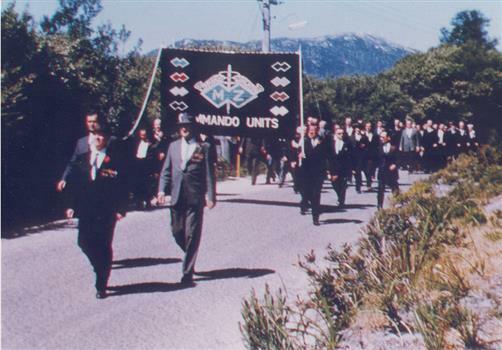 It gives a concise history of 2 Commando Company, from 1955 when it was formed, to 1995, giving details of its Officers Commanding, including its founding OC, their philosophies, and general and significant Company events and personnel over the 50 years. It has 3 chapters describing the development of Australia's Special Forces. 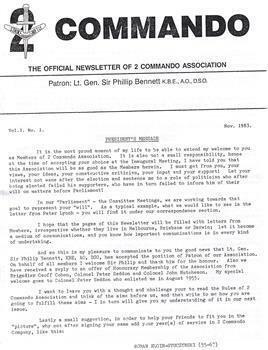 Written to mark the 40th anniversary of 2 Commando Company, and presented to all 2 Commando Association members and friends who attended the 40th anniversary dinner in February 1995. Gives a 40 year history of the Company. NLA ISBN 0 646 22208 2. Copyright 1995. Rectangular colour glossy print photograph of former WW2 Commandos marching at Tidal River. The WW2 Commando memorial cairn was unveiled at Tidal River on 15 November 1964. Former WW2 Commandos march under their Association banner to the cairn for the dedication ceremony. This was the first dedication of a significant WW2 Commando memorial. The Victorian Governor, Lieutenant General Sir Edmund Herring, unveiled the Commemorative Cairn that has become the de facto national Commando memorial.